renowned street artist Fintan Magee. Commissioned by the Quadrangle in partnership with Southern Cross University's Indigenous School Gnibi, the Quad's place-making officer Marisa Snow said the art organisation partnered with Gnibi to develop the mural to celebrate intergenerational exchange of Bundjalung knowledge and language. She said the portrait featured an elder and a young person from the Widjubul Wiyabul clan of the Bundjalung nation to represent their significant role in the preservation and revitalisation of traditional language. Ms Snow said the work's broader theme represented the historic moment in 2017 when the NSW Government passed the nation's first Aboriginal languages legislation, at which Widjubul Wiyabul elders were present. A message stick is held by the subject in the portrait, which was painted by a young Lismore Widjubul man and used in the message stick ceremony at Parliament House. "Celebration and sharing of indigenous culture is at the forefront of the Quad's program and this work is a strong statement to solidify that vision into the future,” Ms Snow said. 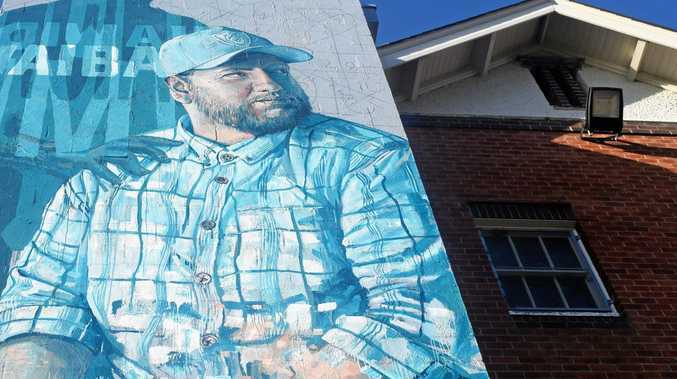 She said the mural was set to be a key feature of the 2019 Quadrangle creative program. "Fintan's work will become an iconic feature of the Quad for many years to come and we are thrilled to be featuring his work in the Quad precinct,” Ms Snow said.